This is the ongoing chronicle of Me, a PKD Patient: Part 1~ April, 2006 until March 5, 2009 on dialysis and blogging my adventures as a participant, and Part 2~ My Kidney Transplant on March 9, 2009 and blogging my adventures in healing and adjusting to Mordechai the Miracle Kidney and integrating this all into my life. 459) Ten Years Ago Today! On this day, back in 2009, I got the phone call everyone on dialysis wants and never expects to get. Lizzie and I spent hours of fretting about whether or not to accept a cadaver kidney coming in from San Antonio (see post # 337*). What a day! We ended up at the Transplant Center that afternoon getting me prepped and prompted for a transplant. It was in no way a normal day... so at the end, I went to sleep. While I was asleep, a miracle occurred: I didn't know the miracle occurred because I was asleep. And the miracle was that "Mordecai the Miracle Kidney" came to live inside me right beside my other kidneys. When I awoke in the morning, the first thing I noticed was that I was still on the planet and boy was I groggy! It took hours and hours for me to fully awaken to the situation. I heard through the web-vine in the last few days, that Bill Peckham is no longer on the planet. His name is sprinkled throughout this blog. You could say we were "blogger buddies" although I think I only talked to him once or twice (see Post 454). 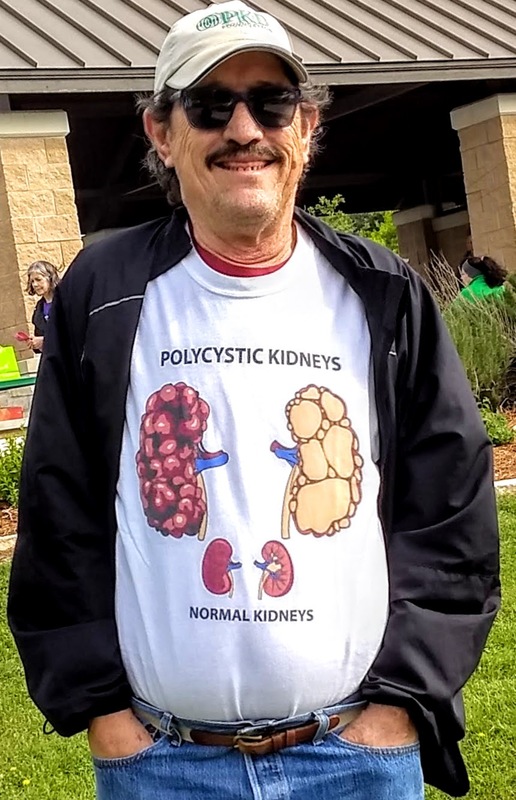 "He started a blog on his own website called The Sharp End of the Needle, that included stories about his travels, debates about policy issues and the ESRD Program and interviews with kidney care staff and fellow patients about ways to get the most out of dialysis. 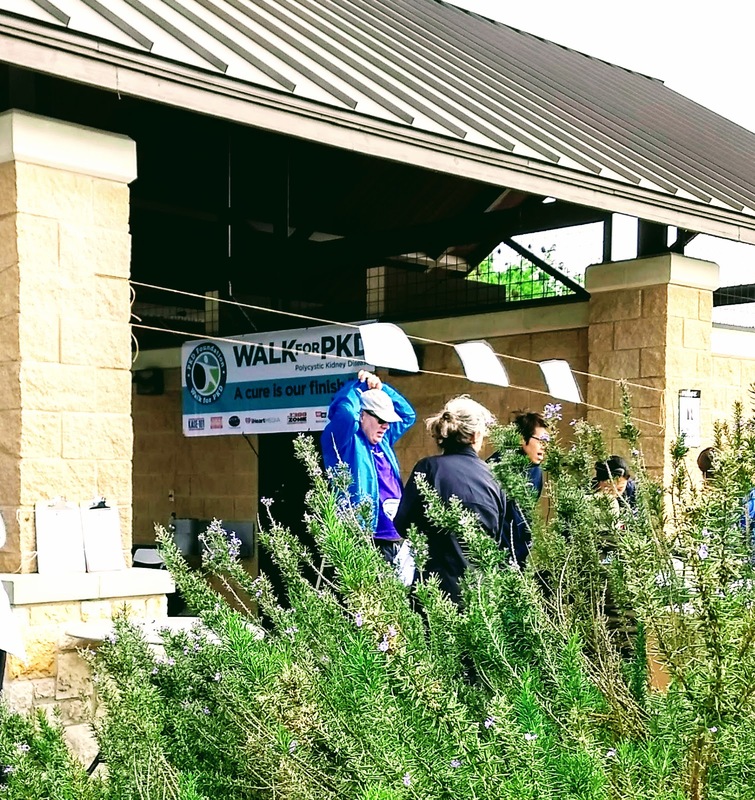 “Nobody signs up for (dialysis) as a lifestyle,” Peckham said in a talk he presented after his Grand Canyon rafting trip, but “being on dialysis really didn’t impact my vision of the future” in carrying on with life. He worked full time for 22 years in the event production industry building conference exhibits before retiring in March 2017." When I was first wondering if and how I could work full time while being on dialysis, Bill's example of dializing all over the world encouraged me to continue to do trainings in other cities and travel to Washington D.C. to advocate ESRD patients. As an advocate, Bill encouraged people to accept dialysis as a way to enable us to live life fully, "the way we are meant to live". 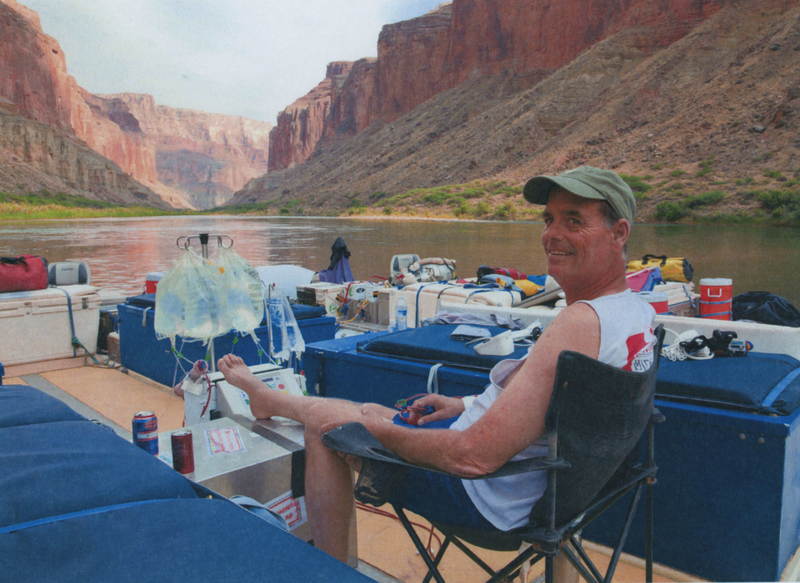 He supported that belief by living fully, including rafting down the Colorado River while use "home" dialysis throughout the trip. Bill Peckham will be missed by the kidney dialysis community: RIP my blogger friend. As I was making coffee and setting out my meds this morning, with the bright sun streaming in the window, I was thinking how I do this every Sunday morning and how the sun hits the table at different angles throughout the year. Year after year after year. 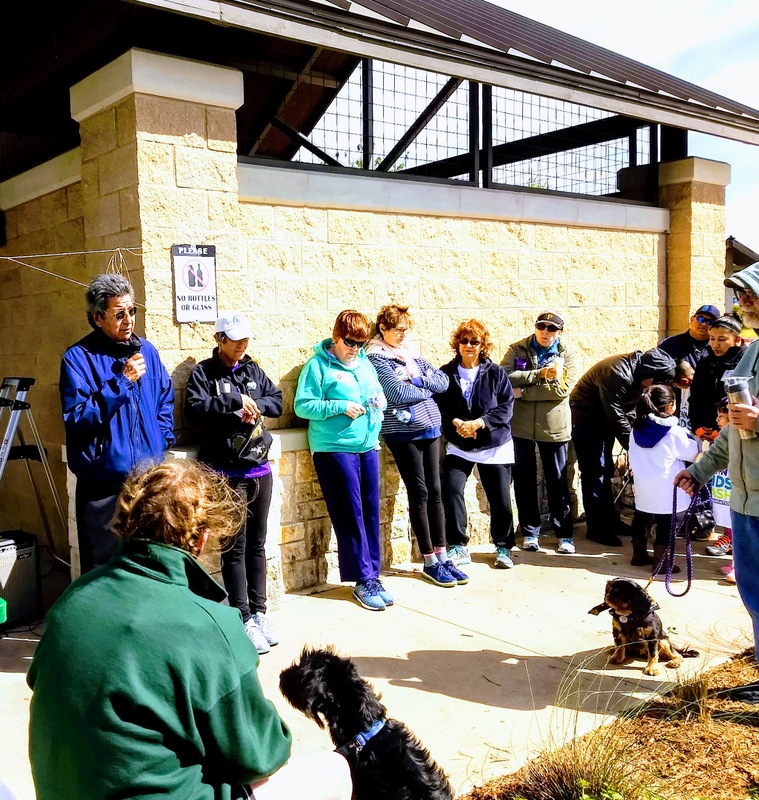 It made me wonder how many times I have performed this ceremony for Mordechai's continued health as well as my own. Using an internet Time & Date Calculator, it comes out that I have completed 476 pill box fillings since March 15, 2009. 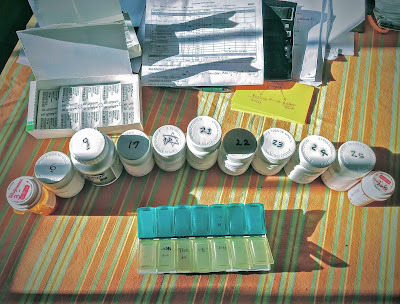 Through many different pill variations (the names and dosages come and go) that are tracked by number sequentially through the years, I have sat down at the head of that table time and time again, arranging the bottles and boxes; getting out a serrated knife with which to extrude the encapsulated cyclosporine capsules from their plastic pouches; pulling out the most recent Clinic list in case I need a reminder about a specific time and dosage; and going through the process slowly and metholically. Although the details evolve and recede like the tides, the process happens every Sunday morning, in synch with the cycle of the Sunlight seasons. So, it goes. 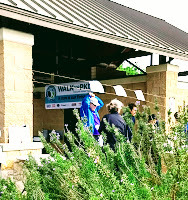 So, on Thursday night I decided that since we are walking, I better get a DONATION PAGE up so we can at least get some of our friends and relations involved too. I get the page up and Liz donates to it while I am still editing it, so it doesn't show her kick in... I am getting to old and senile and rushed to do this it seems. 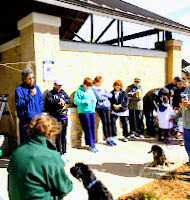 So as we get to the walk today we notice there are lots of new people and some we have seen before. Talked to a woman (organizer) from Boston who received her transplant 15 years ago after being on peritoneal for 5 years. Any how it is now up on FB and here and any donations you wish to make can be attached to this event til June they told us. Anything helps. "Twenty is plenty." "Just sen ten." "Let us know yer alive by pitching in five." Here is me in my favorite educational PKD t-shirt. (455) In Which we get Another Good Report on Mordecai the Miracle Kidney! NOTE: I swear I thought that I put a post up here from the day we forgot that it was Mordecai's 9th birthday. And, that is now the 2nd year we have forgotten the anniversary of my transplant. Liz put a post on my Facebook page on March 9th at 9:00 pm as we realized it was the 9th anniversary. And, I commented that we didn't even have a cake this year. So, anyway I then did my prep for the annual visit to Dr. Lewis, this last weekend, including the 24 hour urine collection on Sunday (good day to pee in a big bottle for 24 hours), and labs on Monday when I turn in all that urine at St. David's South Austin Med Center. As always, my anxiety slowly increases through the week until Liz and I meet with Dr. Lewis at the Kidney Transplant Clinic. Today we got up there and were quickly trying to prepare to tell the nurse all the different docs I've seen over the last year and decide that we really should do some homework listing over the year so we don't have to re-create a list while waiting for the doctor. Dr. Lewis comes in and examines my chart, my labs, and my body. I ask him if the 1.2 creatinine level is okay and he responds, "No... it's spectacular!". I was thinking it is okay but maybe a little higher that it was at some point. He did add that he wants to cut my Myfortic back some and do labs again in April to check. We also discuss my ongoing forgetfulness and he can refer me for some cognitive testing, my hearing problems (which he thinks may be covered under my medicare), my arthritic joint in my hand, and various other medical issues I can't remember right now. He was surprised my blog has over 100 thousand hits now. Me too. So, we leave there in a happy mood. I was just paging down through my Facebook posts and found the following one from Bill Peckham. This guy has been posting on Blogger since before I started many years ago. For a number of years I followed his posts closely since he and I were both experiencing dialysis and writing about our experiences. Bill's digest of information on all the facets of dialysis and resources for patients was always the best of the best, and it appears it still is. Now I have had my transplant for seven and a half years so I don't follow these things as closely as before, though it is awe-inspiring that Bill is still out there informing folks with information that is sometimes difficult to find. Thanks Bill for doing what you do! (453) Silicone Kidneys on the Horizon? This morning I received an email from one of my colleagues (David Ray) asking if I had seen the new issue of Wired; specifically Megan Molteni's article on the future of implanting artificial kidneys. Her article report the results of ongoing research, testing, and design work from the last 20 years and some of the funding history over those years. Now there is exciting news on the possibility of actually implanting an artificial kidney and people "signing up" for being considered when clinical trials begin in 2018 or thereabouts. Exciting Futures for folks on Dialysis! Donate Life ~ Get a organ donor card here!